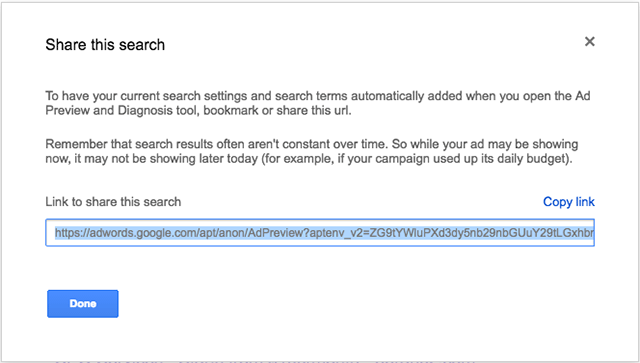 Google added a new feature to the Google AdWords ad preview tool that lets you share the result with your colleagues. After you run a search in the tool, there is a new button at the top right that says "share this result." When you click on it, it opens a dialog that gives you a URL you can email to a friend to see the same result. Google says, "to have your current search settings and search terms automatically added when you open the Ad Preview and Diagnosis tool, bookmark or share this url." "Remember that search results often aren't constant over time. So while your ad may be showing now, it may not be showing later today (for example, if your campaign used up its daily budget)," Google added. You can give it a try yourself at the ad preview tool.